Mattermark — Where Can I Find Contact Information? Where Can I Find Contact Information? Optimize how you connect with your prospects in two ways*: 1) see your LinkedIn connections, or 2) obtain email contact information about 'Key People' at the companies you are interested in. Get started by simply navigating to the right hand side of a company record to the section identified as "Key People." Click on the "View Connections" button to discover who you are personally connected to at a particular company using LinkedIn. If you'd rather develop a new relationship with someone at your company-of-interest, you can search for a specific person or group (i.e. 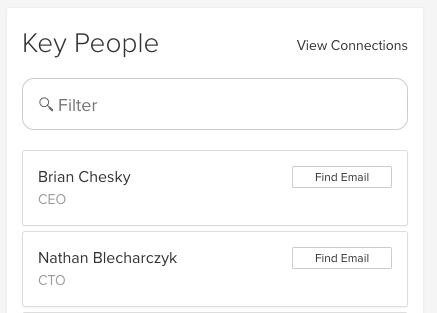 marketing) of people using the "Filter" function, select the person you'd like to reach out to, and click "Find Email" to obtain an accurate email address. It's just that simple. Happy prospecting. *Contact information on "Key People" available only when using Mattermark's $500/per month Professional Plan or Customized Plans. For plans and pricing click here. 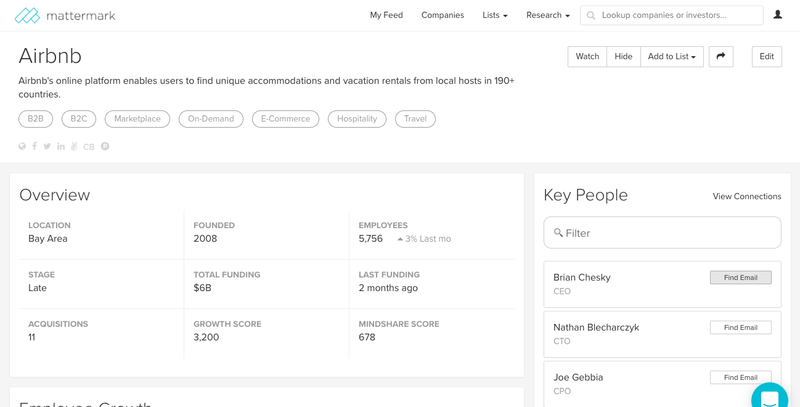 What Types Of Companies Are Tracked In Mattermark? Our customer success team is here for you.